We are pleased to announce that Terasic DE5-Net board has been officially certified as Altera Preferred Board for OpenCL! Since the advent of modern re-programmable ICs, FPGAs have long been touted as the next era of supercomputing. The dream, however, is still currently hindered due to present hardware description languages such as Verilog and VHDL which are too low-level for the majority of current software engineers to adopt. That’s where OpenCL steps in. The DE5-Net FPGA Development Kit features a PCIe Gen3 x8 edge connector, two DDR3 SO-DIMM sockets, four SFP+ connectors, four SATA ports, and much more, allowing researchers to take complete advantage of the on-board Stratix V GX FPGA. The ability for the DE5-Net to reach maximum speeds is due to high-speed simulation of the traces within board, ensuring that the actual hardware meets theoretical goals. As more and more real-life applications in various fields, such as pharmaceutical, bioinformatics, HFT in financial market, and others, require OpenCL implementations, we are confident that DE5-Net FPGA Development Kit is an ideal OpenCL platform that gives satisfactory results in both performance and cost. 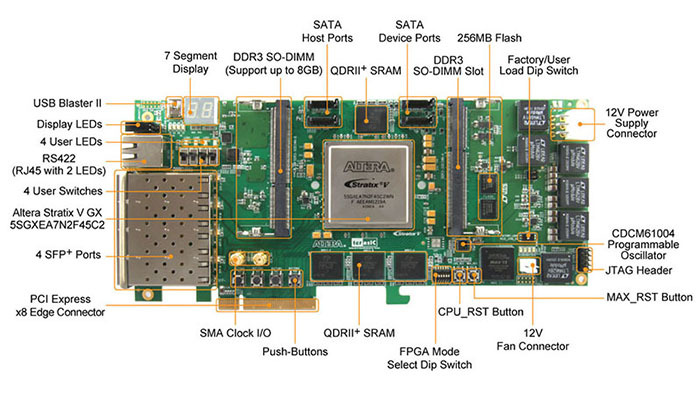 To learn more about the DE5-Net FPGA Development Board, please visit de5-net.terasic.com .